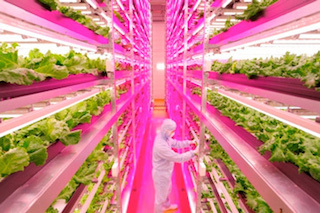 In an abandoned semiconductor fab in Japan, an indoor farm uses hydroponics and LED lighting to achieve yields 100 times greater per square foot than growing outdoors. The facility is in Tagajo, Miyagi Prefecture, in eastern Japan -- 58 miles (94 km) northeast of Fukishima. The 2011 tsunami came onshore there 10 meters high. I don't know if this was the cause of Sony closing its fab; this video alludes to the disaster the area has suffered. But from that disaster a new industry of industrial farming is being born. The farm facility covers 25,000 square feet (0.57 acre). Plant physiologist Shigeharu Shimamura converted it into the world's largest indoor farm illuminated by GE LEDs: 17,500 of them, spread across 18 racks, each 16 levels high. In the ideal conditions of controlled day length, temperature, humidity, moisture, and light inside the farm, lettuce grows to maturity in 40% the time it takes in the air outside. The loss rate to spoilage or insects is better inside by a factor of four: 10% loss in the facility, 30% to 50% outside. The operation requires only 1% of the water that outdoor farming demands. The GE LEDs were tuned to emit the optimal spectrum for growth, according to TreeHugger.com; it doesn't say whether the light formula is particular to the variety of lettuce being grown. Testing began two years ago and the LED design was finalized a year later. The lights require 40% less power than fluorescents. "What we need to do is not just setting up more days and nights," Shimamura said in a press release. "We want to achieve the best combination of photosynthesis during the day and breathing at night by controlling the lighting and the environment."